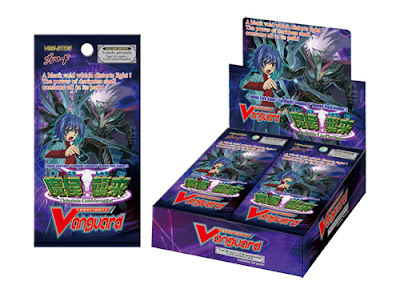 This morning Bushiroad announced the international release of VGE-BT03: Demonic Lord Invasion, Cardfight!! Vanguard's third booster set overall and the fifth booster set to be released in English-speaking territories. Featuring the proper introduction of the major figure clans Dark Irregulars and Pale Moon, as well as Oracle Think Tank's powerful Tsukuyomi series, Demonic Lord Invasion has been the subject of much controversy and debate in the English-speaking world, where its perceived upstaging by limit break-focused sets and main character clans was subject to fan outrage. Being one of three main booster sets initially speculated to never receive an international release, the news comes as a welcome reprieve to fans in English-speaking territories. Demonic Lord Invasion is set for a release in Singapore on August 4, 2012 and an international release of August 11, 2012. Immediately on its heels is VGE-BT07: Rampage of the Beast King, a core booster set intended to complement the Great Nature units BT02 by expanding them into a full clan with the powerful Locks series cards and limit break units. BT07's full contents is still not known, as it has yet to be released in the Japanese game, but will feature units primarily used by Team SIT Genius and members of Team Foo Fighter AL4, Narumi Asaka and Shinjou Tetsu. Rampage of the Beast King is being slated for a fall release. Likewise due for a fall release is VGE-EB02: Banquet of Divas, the second extra booster set and sixth booster set overall. Being solely dedicated to the Bermuda Triangle clan used by Sendou Emi, and carrying a lower overall card count than main sets, Banquet of Divas by far offers the easiest to complete clan out of any in Cardfight's history. It is currently under speculation that as with past English booster sets BT06 and EB03, the chief reason for this rapid release schedule is to expand the sets' card count by including promo cards in them, thereby increasing card availability in the English game. How this will affect Banquet of Divas' single-clan take is currently unknown. Update: Bushiroad has confirmed on their blog that BT03 contains 2 more R-rarity cards than the Japanese release.